Animal manure has long been used as a nutrient source for crop growth. Using manure on the farm can greatly reduce the need to purchase fertilizers. Estimates of manure nutrient content are available from a number of published sources, but nutrient composition varies widely between farms due to differences in animal species, age of animal, feed ration, type and amount of bedding, storage structures, and manure handling. For example the nitrogen content of dairy cow solid manure may vary from 3 to 33 lb N/ton, and for phosphorous from 0.2 to 35 lb P/ton. In order to maximize the economic value of manure, a nutrient analysis should be conducted. Knowing the nutritive value of one's manure is as important as knowing the nutrient content of purchased fertilizer or animal feed. Remember that stockpiled manure and poultry litter should be stored under cover on an impervious surface. It is essential that the sample obtained for analysis represent the manure that is applied to the fields. Unfortunately, manure nutrient content is not uniform within storage structures and obtaining an accurate manure sample can be challenging. Manure nutrient content may vary with time and method of storage. Test results may not be accurate when manure is not thoroughly mixed. Therefore, for more meaningful results samples should be taken near or at the time of application. This is when slurry pit manure is likely being agitated in order to load the tank, and semi-solid manure is moderately mixed after being loaded into a box spreader. But remember when samples are taken during hauling, the results can only be used for a subsequent manure spreading plan and to adjust commercial fertilizer application in the future. Take manure samples annually for three years, followed by samples every 4-5 years. If storages are emptied twice a year, it is recommended to sample in both spring and fall since the different storage temperatures in summer compared to winter will affect manure nutrient levels. It is recommended to collect solid manure samples directly from the spreader using a pitchfork, shovel, or plastic gloves. Collect 5-10 sub-samples from different loads. Avoid large pieces or chunks of bedding. Mix all sub-samples thoroughly and remove a cup, placing it in a heavy weight plastic freezer bag. Squeeze the bag to remove air. Use a second freezer bag to prevent possible leakage. Identify 10-12 widely dispersed points on the stack that represent the average moisture content of the manure. Samples should be taken from a depth of at least 18 inches at various locations of the pile. From each point, remove the top crust layer which is lower in nutrient and collect 3 to 5 sub-samples using a small shovel or plastic gloves. Place all sub-samples in a wheelbarrow or plastic bucket. Thoroughly mix and crumble the collected sub-samples. Remove one cup and place it in a heavy weight plastic freezer bag. Samples must be kept cool to prevent any ammonia nitrogen loss. Freeze the sample before sending it to the lab for analysis. Use a rapid transit courier. 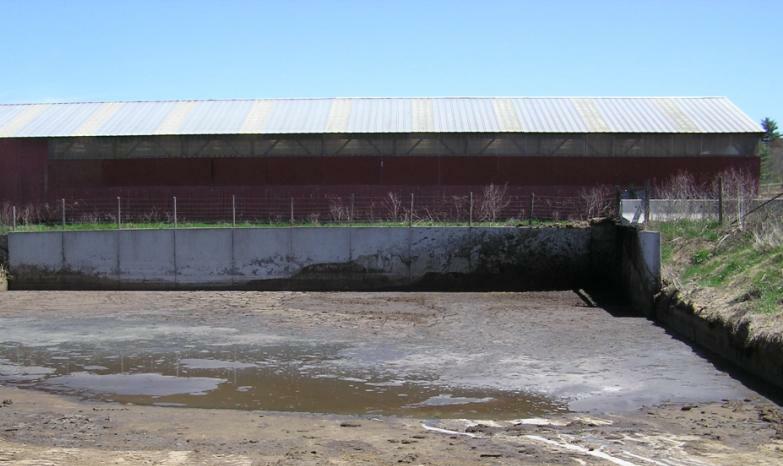 Dairy manure (about 12% solid as excreted) and hog manure (about 10% solid as excreted) is often collected and stored as a slurry in earthen, concrete, or steel storage structures. Agitate the manure mixture for 2 to 4 hours before sampling. Sub-samples can be dipped from the agitated storage using a bucket on a rope, thrown into the manure storage, or taken from spreader tank loads, or taken from transfer pipe. Samples also may be taken at the time of application. Place 3-6 small buckets (plastic coffee cans) at several locations in the field(s). Place all sub-samples in a larger clean plastic pail and stir the contents thoroughly. Use a long handled dipper to take several cups of mixture into a clean one quart plastic bottle until the liquid is about 2-3 inches from the top of the bottle. Liquids, such as effluent from a solid separator or runoff from an outdoor open feedlot, are often stored in earthen structures. They can be sampled following the procedure for sampling slurry, although most of the solids in liquid manure are suspended, and therefore, agitation for mixing may not be necessary. 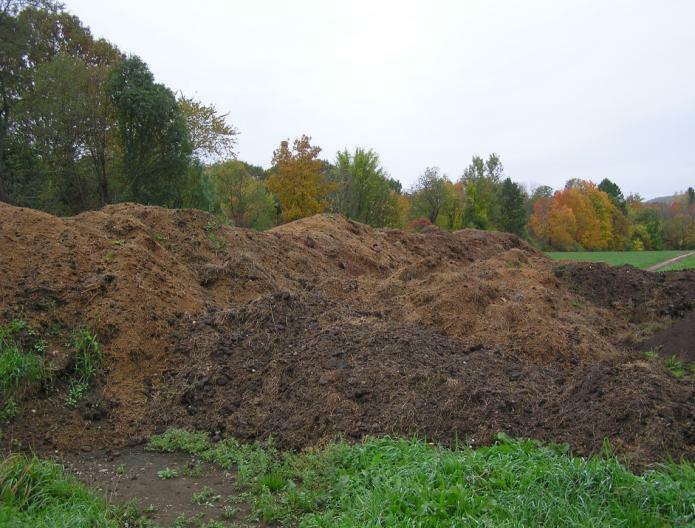 Currently, the University of Vermont accepts manure samples for nutrient analysis. Address samples to: Agricultural and Environmental Testing Lab, 219 Hills Building, Univ. of Vermont, Burlington, VT 05405-0082 or call 1-800-244-6402 for more information. Note: It is essential that the sample obtained for analysis represent the manure that is applied to the fields.